Back in October, we bought and moved into our new home in Westport. It's a 1939 Cape Cod style house that wasn't what I was looking for, but it turns out, exactly we wanted. I really feel that one of the things that turns a house into a home is having printed, beautiful photos on display around the house. Personally, we have a collection of large posters, and I like to keep things to a minimum, but I can't tell you how many times I walk by a photograph of one of my children and pause. It simply brings joy to see images of my kids around the house! 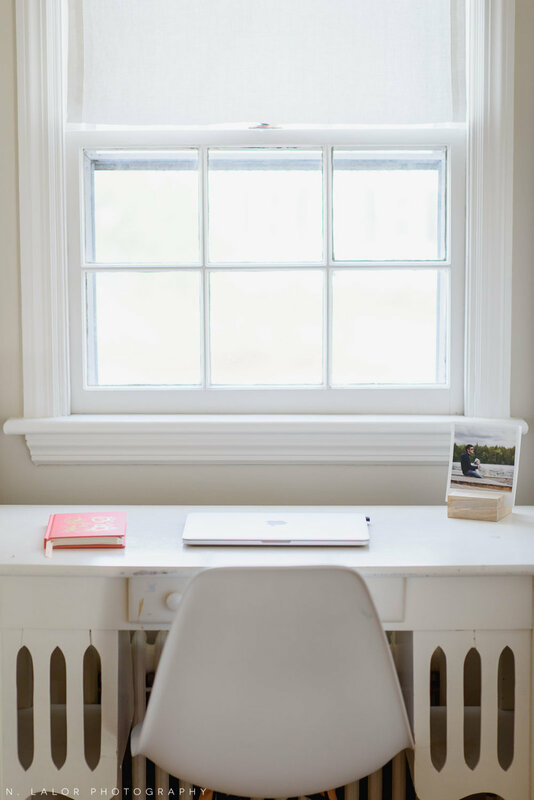 Upstairs, there's our little work desk, nestled between two built-ins in the master bedroom (and taking up the space in one of the dormers). I have a stack of Artifact Uprising prints with the wood block that I purchased almost three years ago, which gave the inspiration for the walnut wood stand I provide to my clients. 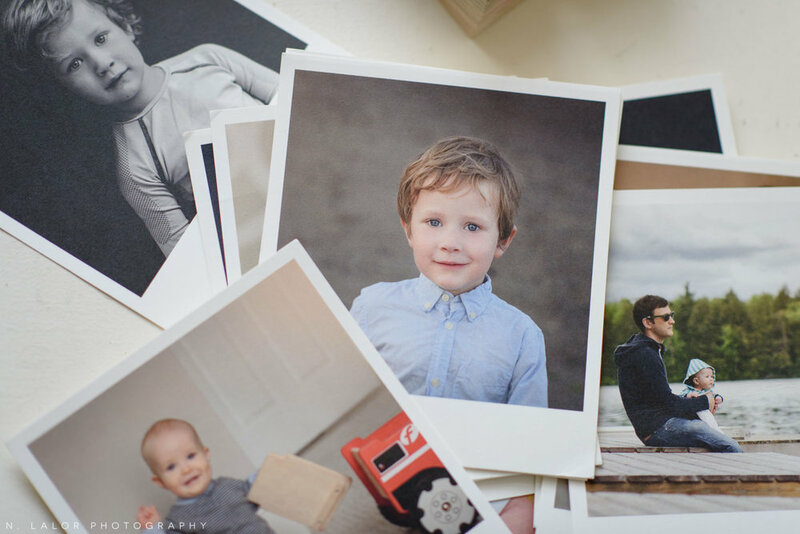 The prints themselves have been handled by little toddler hands, with bends and scrapes, but survived (for the most part). Each of my children has photos of themselves in their room. This is a natural transition from when they shared a room and I identified their identical twin beds by the photograph that was hanging on the wall next to it. Each of the boy's bedrooms has a totally different feel. Elliot's is bright and sunny, Graham's is more serious and calm. Elliot, for some reason, insisted that his photo is placed on the window sill. 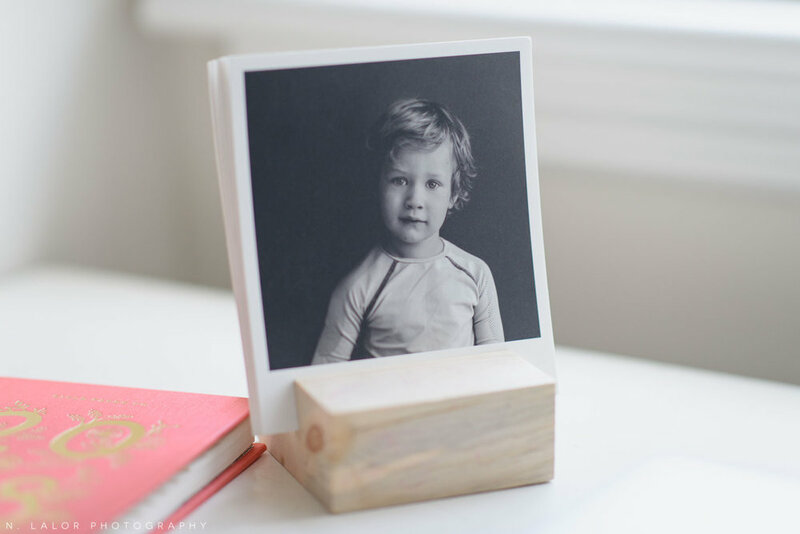 It's an 8x10" board-backed photograph that is displayed in a wood block stand from Saw & Mitre Frame Co. I am just thankful that he chose the window without the steam radiator under it (since heat kills photo longevity). 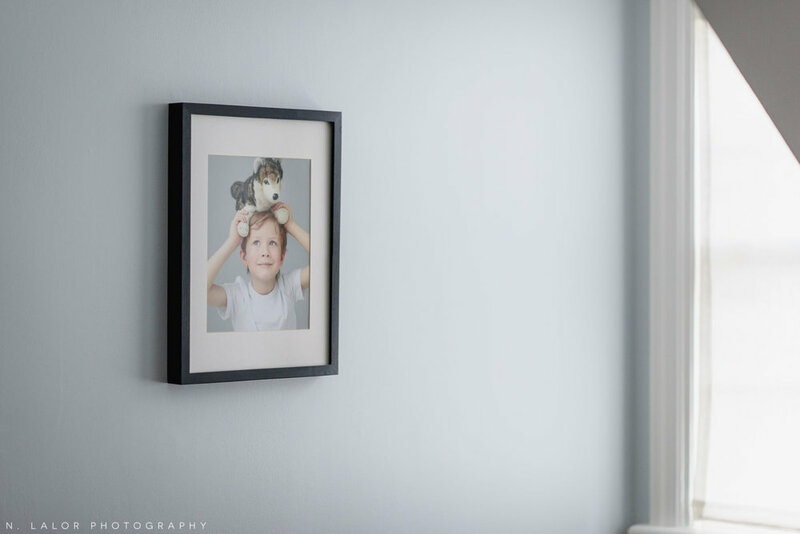 My oldest, Graham has a few photos, including one of him with his favorite stuffed toy (a Husky dog, which my husband jokes is his future college mascot). He has sloping cape ceilings and blue walls, and somehow that image fits perfectly. 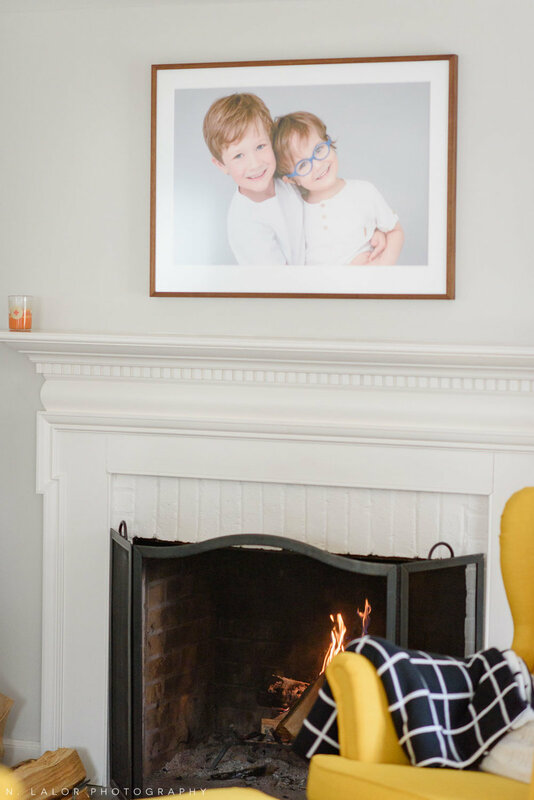 Downstairs, I love the 20x30" fine art print of the two boys, displayed in a beautiful walnut frame by Saw & Mitre Frame Co. The size sounds BIG, but in the space, even with 7-foot ceilings, it looks fitting. And yes, it's above our fireplace, mostly because the fire doesn't actually provide enough heat to do any damage. That might change in the future as we're looking at ways to optimize the heat output, so we'll see. All I know is that a photograph like that will look stunning anywhere in the home. I didn't hesitate for a second when considering the size, because I know I will always find a great spot for it. We have a lot of built-ins in the house, which is amazingly charming.. and I'm still learning the best way to design the displays within them (since I have very few items whose purpose is to look pretty). But I love the matted photograph I have of Graham in Vermont, displayed the way I tell my clients to display their images - on a walnut stand that's custom made for the prints. And there's a little heirloom box for Elliot (Graham has one as well), which stores all his photographs and keepsakes since he was born (also, the dollar bills that Nana sometimes sends him for holidays). And of course, the 10x10" canvas of Graham that's in our family room.. it brightens up the space even though it's so tiny. And that's it! I don't have a house overflowing with photographs because I lean towards minimalism (and hate dusting)... but there's definitely a cherished image or art piece in every single room. It's a work in progress and all that, but this house is something of a 'forever home' for us and I love all the charm and character that comes with it.